Ovarian cysts are most often fluid filled growths that arise from the ovaries. Their size can vary from a few centimeters to over 1 foot in size. They are a very common reason for gynecology consultation. Functional Cysts: the most common type in reproductive aged women. Examples include follicular, corpus luteum, and theca lutein cysts. In general these cysts are caused by changes in hormone levels, and can themselves cause further hormonal imbalances. On average these cysts are about 4-5 cm in diameter and usually regress spontaneously within 4-8 weeks. They can cause abdominal pain, especially if they rupture and release either blood or fluid into the abdomen. Benign Neoplastic (meaning growth of abnormal tissue) Cysts: less common than functional cysts. The most common type is the benign cystic teratoma or Dermoid Ovarian Cyst (dermoid cyst). These cysts can be asymptomatic or cause pelvic pain, and usually do not resolve spontaneously. Endometriotic Cysts: can occur when endometriosis develops in the ovaries. 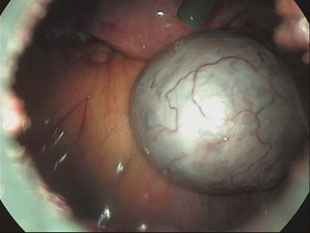 These cysts which are also known as "chocolate cysts" due to their characteristic appearance when they rupture can cause pelvic pain, adhesions, and infertility. These cysts usually do not resolve spontaneously. Malignant Cysts: occur more frequently after menopause but can occur in any age group. Suspicion for malignancy is increased when certain characteristics are seen on physical exam, ultrasound, and patient history. There is currently no good screening test for ovarian cancer, although certain new blood markers are being studied. All ovarian cysts can rupture and spill their contents into the abdominal cavity, which can cause pain and possibly bleeding from the ovary itself. When this occurs, surgical intervention may be required. Ovarian cysts, especially when greater than 5cm in size, can also undergo torsion, whereby the cyst twists upon its stalk cutting off the blood supply to the ovary. This situation causes severe abdominal pain and requires immediate surgical intervention. Treatment is individualized according to the specific clinical scenario, and findings on ultrasound and physical exam. Options include observation, serial ultrasound exams, or surgical intervention in the form of cystectomy (removal of the cyst) or oophorectomy (removal of the ovary). Do you have cysts in your ovaries?